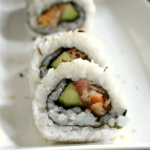 Shrimp Tempura Roll, or the best homemade sushi recipe. 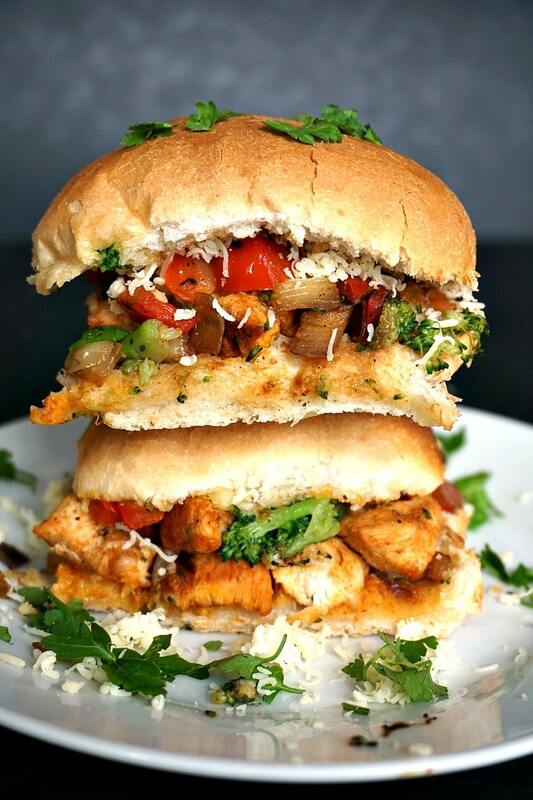 Quick and easy to make, and as tasty as the real deal. These low-calorie bites are the perfect party food for any occasion. It is a known fact that some dishes are more popular outside their country of origin, believe it or not. And sushi is no exception here. Yes, sushi is a Japanese dish, although it’s pretty basic compared to the Western variation, where more ingredients are used to appeal to the western palate. Even so, everybody agrees that sushi is just the perfect party appetizer. And if you are planning big parties like the New Year Eve, a fancy birthday party and so on, then sushi should not miss from the menu. 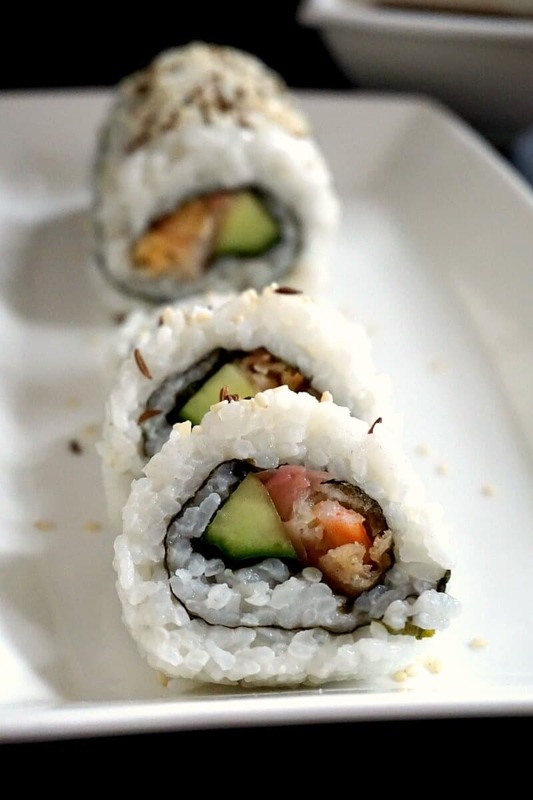 And while the restaurant sushi roll is so delicious, but equaly expensive, you might as well make your own homemade sushi roll, and I guarantee you will get the same taste, with less money. Not to mention you get to use any ingredients you want. And this time I opted for a fabulous shrimp tempura roll with cucumber and pickled ginger, although I am planning to try as many variations as possible. 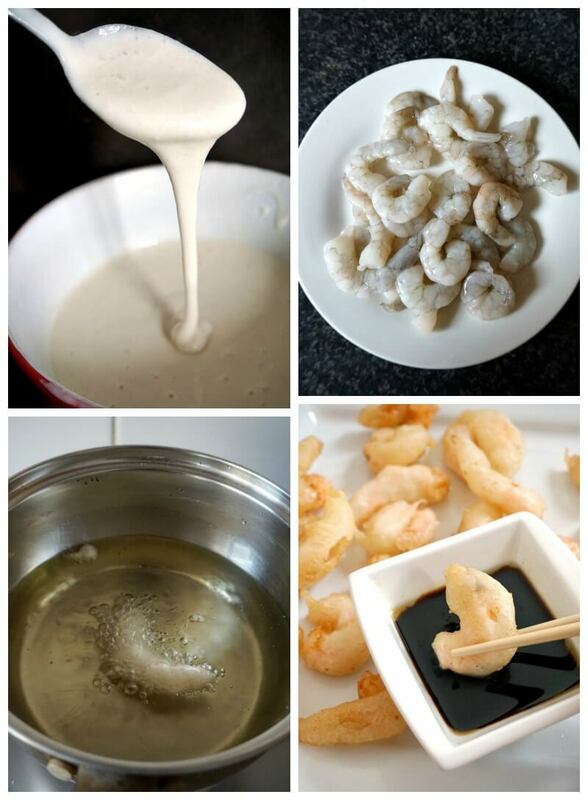 How do you make shrimp tempura? But first, let’s see how to make the best crispy shrimp tempura, and then we can go on with our shrimp tempura sushi. Shrimp tempura is basically shrimp coated in a light batter, then deep fried to perfection to get it nice and crispy on the outside, and nicely cooked on the inside. BEAR IN MIND THAT SHRIMP COOKS VERY QUICKLY, DO NOT OVERCOOK IT, OTHERWISE YOU GET A RUBBERY TEXTURE. My tempura batter can’t be simpler, and it’s the lightest, and easiest you can get. Make sure there are no lumps in the batter. If necessarily, pass it through a sieve, and do not overcoat the shrimp, we want it light, but perfectly coated before dipping it in the hot oil. It might sound complicated, but it’s actually easy peasy, trust me. And the same tempura batter can be used for any other kind of seafood, or even vegetables. What is a tempura roll? A tempura roll is cooked sushi rice spread on a nori sheet, then topped with tempura shrimp (or any other fish or vegetable), then rolled tightly and cut into pieces. Now, once we’ve got the shrimp tempura, it’s time we got on with our shrimp tempura roll. And for that we need sushi rice, which is a short-grained rice that sticks together when cooked. It’s the perfect rice for sushi, so that we can easily roll the sushi. Most supermarkets will have the sticky rice in the international aisle, so worth giving it a go, even if it’s a bit more expensive than the regular rice. 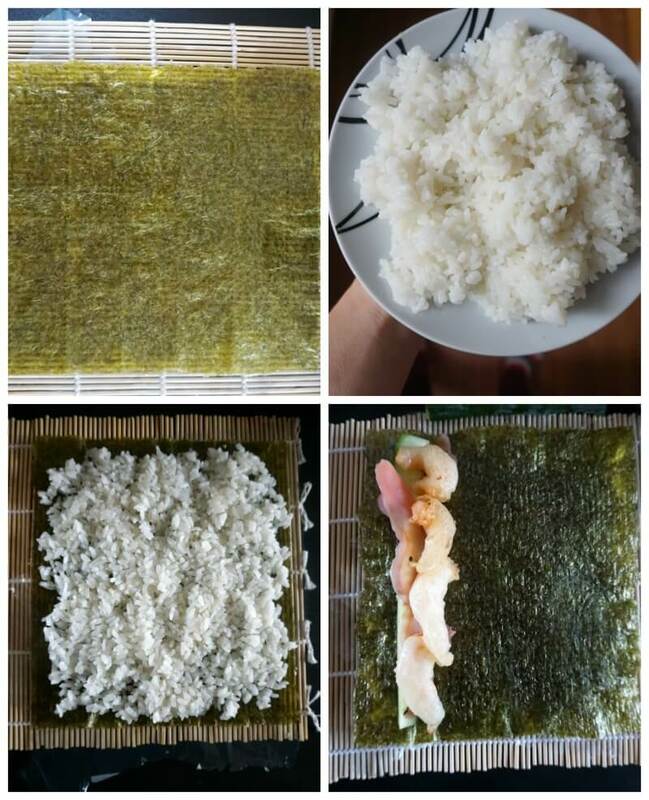 Another basic ingredient is the nori sheet, or dried seaweed sheet. It gives the roll that distinctive flavour we love about sushi. You can go for the most common sushi roll, which has the nori sheet on the outside, or, like my version, the inside-out variation. In this one, the nori-covered filling is in the middle of the roll, and the rice around the outside. Whatever you go for, it does not make any different to the taste, it’s purely aesthetic. So, just go for what it’s easier for you. Do you need a bamboo mat for sushi? A bamboo mat helps massively with the rolling part, but if you don’t have one, not a big deal. Just make sure you use a good kitchen foil, then spread the rice over and follow the exact same steps. It might not be as easy as with a bamboo mat, but it’s doable. 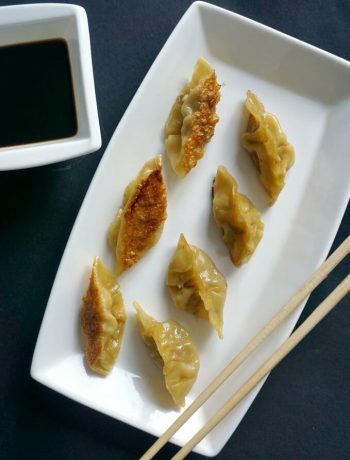 And since we’ve talked about sushi being the perfect appetizer for your New Year Eve Party, how about these Quick and Easy New Year’s Eve Appetizers to help you plan the perfect menu for the most important party of the year? 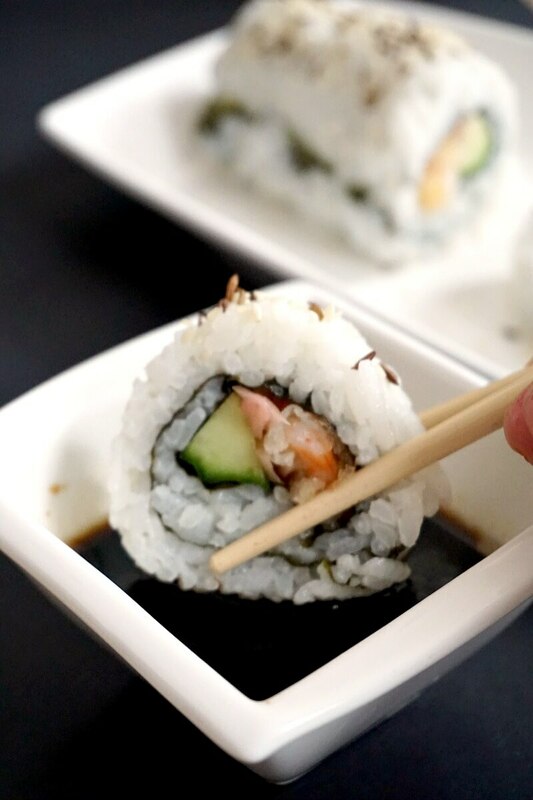 If you’ve liked my HOMEMADE SHRIMP TEMPURA ROLL OR SUSHI or any other recipe on the blog then don’t forget to rate the recipe and let me know how you got on in the comments below, I love hearing from you! You can also FOLLOW ME on FACEBOOK, and PINTEREST to see more delicious food and what I’m getting up to. Shrimp Tempura Roll, or the best homemade sushi. Quick and easy to make, and as tasty as the real deal. These bites are the perfect party food for any occasion. To make the shrimp tempura, mix the flour, cornflour, baking powder, salt and sparkling water to form a light batter of creamy consistency. In a large pan, add vegetable oil (the amount depending on the size of your pan, but about 2 cups should be enough), heat it up, then coat each shrimp in the batter, shaking any excess. Fry for about one minute each shrimp, until the outside is golden and crispy. Repeat with the remaining shrimp. To make the sushi roll, cook the rice according to the packet instruction, adding the rice vinegar to it, then leave it to cool completely. Place the bamboo mat on the work surface, then cover it with a plastic sheet just to protect it from getting sticky from the rice. Place the nori sheet on top of the pastic sheet, then spread half of the rice evenly over the nori, then flip the nori upside down so the rice is underneath and the nori sheet on top. Add half of the shrimp tempura, cucumber sticks, and ginger near the edge of the nori closest to you. Lift the end of the mat and roll it away using your thumbs to hold the filling in place until the nori forms a roll. Chops the ends of the roll to make it neat, then cut into equal mini sushi rolls. Repeat the process with the remaining ingredients, so you will have to big rolls.